Judy is the creator/host of ‘Laughlines’ and ‘Stand Up For The Girls’ which have both helped raise over $650,000 for breast cancer research. Buy the Book Judy has co-written with fellow speakers; Judy Suke, Meg Soper and Susan Stewart. 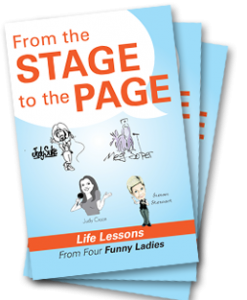 This is a hands-on workbook for comedians, corporate speakers and anyone who just wants to be funny! Your comedy was a breath of fresh air and your “Dealing with Office Hecklers” workshop armed us with some terrific tips for the front lines. We were thrilled when Judy agreed to speak at our TEDxStMaryCSSchool event. She gave an inspiring, funny and deeply personal talk that really resonated with our students. Many of our students felt her talk really spoke to them and inspired them to find and live their passion as Judy has. Insightful and humorous, Judy provides life’s recipe for living well without resorting to tofu! The strategies that Judy has developed as a performer in dealing with hecklers also work in an office environment. Judy was such a wonderful emcee at our gala fundraiser that we invites her back again this year! Her comedy kept our guests laughing all night and she carried the evening with an easy flow and great professionalism. I would highly recommend her to anyone if you are looking to elevate your event. Thank you so very much! It was our pleasure to have you join our annual staff retreat. Thank you for your gracious and truly professional presentation. It was a delight working with you and we look forward to the next opportunity. We hired Judy as an emcee for a gala dinner we hold every year in Toronto. Judy was a true professional, easy to work with, kept our audience engaged and of course laughing. She is definitely top in her field and I highly recommend hiring Judy for any corporate event. As Human Resource Professionals, a sense of humour is not only an asset, it’s an essential survival tool. Judy delivered a stellar keynote address to our HR leadership group that struck the perfect balance of laugh-out-loud hilarity with heartfelt takeaways to live a more balanced life. Judy was fantastic and everyone loved her! Great end to the day! Judy was an excellent speaker and motivational humourist! Our participants enjoyed her positivity, her stories, and her message of relieving stress with humour. Great fun! Judy is a stand-up coach at Second City, MoSpeakers Big Day Academy and she also teaches privately. 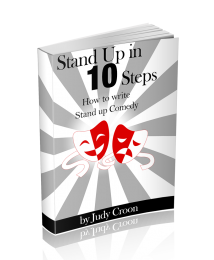 She is the author of ‘Stand-Up Comedy School: Stand Up in 10 Steps‘.